I wonder if they censored “Chinaman is not the preferred nomenclature.” Would kind of kill the joke. Watching this movie censored would be a travesty. Do you have to use so many cuss words? 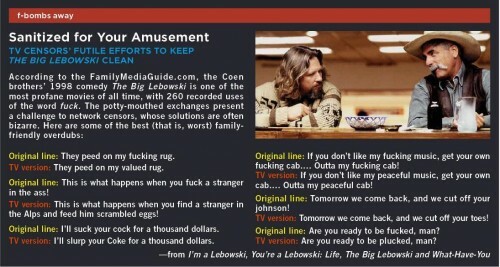 I see Tiki is drunk again, misspelled Lebowski even though it’s in big blue letters on the picture. find you all in the alps, you valued coke-slurpers! WHEN they rerelease this on dvd or blugay, i sincerely hope they have a censored audio track. i’d love to listen to it. Mr. Treehorn draws a lot of water in this town, Lebowski. I’ve had it on DVD for years.